This is one of those great recipes for the Winter months or just a cold day. I have had this recipe for 6 years but have only made this dish once. The family loved it served with mashed potato and vegetables. I cooked it using a slow cooker but because this recipe is so versatile it can be also cooked on the stove, in the oven or even in a pressure cooker. The instructions for the different cooking methods can be found below. 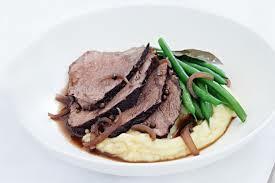 You can also substitute the beef bolar blade for a rolled and tied beef brisket. I hope you get to try this recipe, enjoy! Heat half the oil in a pan or stockpot over medium-high heat. Add the beef and cook, turning occasionally, for 8-10 minutes or until browned. Transfer to a plate. Heat the remaining oil in the pot over medium-high heat. Add the onion and cook, stirring, for 5 minutes or until soft. Add the beef, red wine, stock, peppercorns, thyme and bay leaves to the pan. Bring to the boil. Reduce heat to low. Cover and simmer for 1½ hours or until the beef is tender. Transfer beef to a plate. Cover to keep warm. Increase heat to high. Boil for 15 minutes or until the sauce reduces by half. This recipe can be cooked in a slow cooker, pressure cooker, on the stove or in the oven. Use left over meat for sandwiches the next day. Can be frozen for 3 months (transfer to containers when cooked and cooled before thickening the gravy). Thaw overnight in fridge and reheat in a stock pot cooking covered on a medium heat until heated through, then thicken the gravy. Try throwing in some vegetables with the meat to add to the flavour. Rest the meat on a bed of vegetables to stop it from catching to the bottom of the dish or pot. Reduce the wine to 250ml (1 cup) red wine. Reduce the stock to 125ml (½ cup) beef stock. Brown the meat and onion in a frying pan. Place the beef, onion, red wine, stock, peppercorns, thyme and bay leaves in the slow cooker. Cook, covered, on low for 8 hours then serve straight from the cooker. Place the beef, onion, red wine, stock, peppercorns, thyme and bay leaves in the pressure cooker. Seal and place over high heat until steam begins to escape at a constant rate and there is a regular hissing sound. Reduce heat to low and cook for 30 minutes. Release the steam following the manufacturer’s instructions. Remove the meat, keeping it covered. Boil the sauce, uncovered, in the pressure cooker pan and serve.